Atlanta on FX: Cancelled or Renewed for Season Three? Will Earn and Alfred make it? 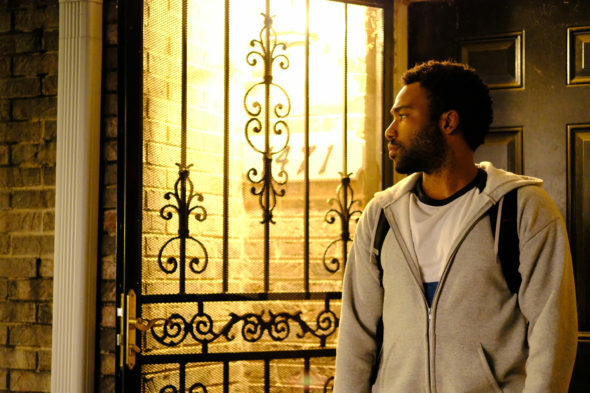 Is the Atlanta TV show cancelled or renewed for a third season on FX? The television vulture is watching all the latest cancellation and renewal news, so this page is the place to track the status of Atlanta, season three. Bookmark it, or subscribe for the latest updates. Remember, the television vulture is watching your shows. Are you? An FX comedy-drama, Atlanta stars creator Donald Glover, with Keith Stanfield, Brian Tyree Henry, and Zazie Beetz. In season two (aka Atlanta Robbin’ Season), young manager “Earnest “Earn” Marks (Glover) is trying to launch his cousin Alfred’s career. A rapper — Alfred Miles (Henry) is trying to toe the line between real life and street life. Meanwhile, Darius (Stanfield) is Alfred’s go-to man, and Van (Beetz) is Earn’s best friend, and the mother of his daughter. The second season of Atlanta averaged a 0.33 rating in the 18-49 demographic and 639,000 viewers. Compared to season one, that’s down by 25% in the demo and down by 28% in viewership. Find out how Atlanta stacks up against the other FX TV shows. Atlanta has been renewed for a third season which will debut TBD 2019. Stay tuned for further updates. Though the ratings have been much lower than last season, I suspect FX will still renew this series for a third season. I’ll update this page with breaking developments. Subscribe for free updates on any Atlanta cancellation or renewal news. 6/7/18 update: FX has renewed the Atlanta TV show for a third season. Details here. TV show ratings are still important. Follow Atlanta‘s weekly ups and downs. Find more Atlanta TV series news or other FX TV show news. What do you think? Are you glad that the Atlanta TV show has been renewed for a third season? How would you feel if FX had cancelled this TV series, instead? More about: Atlanta, Atlanta: canceled or renewed?, Atlanta: ratings, FX TV shows: canceled or renewed? Atlanta: Is the FX TV Show Cancelled or Renewed for Season Two? Feud: Cancelled or Renewed for Season Two on FX? Season one aired in the fall. This season is going head to head with the NBA playoffs. I think in that context they’re ok with the dip. It’s even more culturally relevant this year and will likely win even more awards.